The design of the side channel pump allows for the transfer of liquid-gas mixtures with up to 50% vapor; therefore, eliminating possible air or vapor locking that can occur in other pump designs. A special suction impeller lowers the NPSH requirement for the pump. The side-channel pump design is similar to a regenerative turbine in that the impeller makes regenerative passes through the liquid. However, the actual design of the impeller and casing and the principles of operation differ greatly. The liquid or liquid/vapor mixture enters each stage of the pump through the inlet port. Once the pump is initially filled with liquid, the pump will provide a siphoning effect at the inlet port. The effect is similar to what happens in water ring pumps. The water remaining in the pump casing forms a type of water ring with a free surface. A venturi effect is created by the rotation of the impeller and the free surface of the water, thus pulling the liquid into the casing. After the liquid is pulled through the inlet port, it is forced to the outer periphery of the impeller blade by centrifugal action. It is through this centrifugal action that the liquid is accelerated and forced into the side channel. The liquid then flows along the semicircular contour of the side channel from the outermost point to the innermost point until once again it is accelerated by the impeller blade. The liquid moves several times between the impeller and the side channel. Thus the rotating impeller makes several regenerative passes until the liquid reaches the outlet port. The speed of the impeller and the centrifugal action impart energy to the liquid through the exchange of momentum, thus allowing the pump to build pressure. The side channel leads directly to the outlet port. At the outlet port, the main channel ends and a smaller mini channel begins. At the point where the mini-channel ends, there is a small secondary discharge port level with the base of the impeller blades. As the liquid is forced to the periphery through centrifugal action due to its density, the vapor within the liquid stream tends to remain at the base of the impeller blades since it has a much lower density. The main portion of liquid and possibly some vapor, depending on the mix, is discharged through the outlet port. A small portion of the liquid flow follows the mini-channel and eventually is forced into the area between the impeller blades. The remaining vapor which was not drawn through the outlet port resides at the base of the impeller blades. At the end of the mini channel, as the liquid is forced into the area between the blades, the area between and around the impeller blade is reduced. The liquid between the blades displaces and thus compresses the remaining vapor at the base of the impeller blades. The compressed vapor is then forced through the secondary discharge port where it combines with the liquid discharged through the outlet port as it is pulled into the next stage or discharged from the pump. Thus entrained vapor is moved through each stage of the pump. Each subsequent stage operates under the same principle. The number of stages can be varied to meet the required discharge head. When multiple stages are required, the relative positions of the stage outlet ports are radially staggered to balance shaft loads. Refined fuels are petroleum products that are produced from refining processes known as catalytic cracking and fractional distillation. Fractional distillation is a process that uses a heated distillation column to separate a mixture into its individual components. As a mixture is heated in the distillation column, it will eventually reach the boiling point of each component. When the boiling point for a particular component is reached, it will vaporize and separate from the remaining liquid mixture. As the vapor rises, it is separated in another container where it is cooled and condensed back to a liquid. Catalytic cracking is a widely used refining process. Simply stated, catalytic cracking is a process that breaks down longer chains of hydrocarbons to shorter ones that burn more easily. Unlike thermal cracking, catalytic cracking produces a higher octane gas and higher quality of byproduct gases. Corken’s sliding vane petroleum pumps are used to load and unload refined fuels and petroleum products all around the world. Whether it’s a stationary bulk plant pump for aviation refueling, refined fuel truck pump for large bulk deliveries or smaller pumps for lube and fuel oil delivery trucks, Corken’s sliding vane pumps offer a dependable and efficient liquid transfer solution. Corken has been providing industrial pumping solutions to the chemical, petrochemical, and petroleum, oil and natural gas, and liquefied gases, and truck and transport markets for many years. Our quality, performance, and ease of routine maintenance have built a strong presence within these industries. Our line of industrial pumps is comprised of three different technologies: regenerative turbine, positive displacement sliding vane, and a multi-stage side channel. Many are available with mechanically sealed and sealless (magnetic drive) options. We offer a pumping solution for a wide range of liquids, differential pressures, and viscosities up to 20,000 SSU. Liquids include but are not limited to ammonia, aviation fuel, fuel oil, lube oil, solvents and CO2. If one of our standard mounting options does not meet your needs, custom engineered industrial pump skids are available. Each product product group below is designed for a specific range of viscosities and differential pressures. For more information on our industrial pumping solutions, click on one of the product groups listed below. Corken’s positive displacement sliding-vane pump is known as a Coro-Vane®. Corken offers several models sliding vane pumps for wide range of vapor pressures, differential pressures, capacities, and viscosities. Sliding vane pumps can handle small amounts of vapor and offer exceptional performance with light liquids and liquefied gases. Each model comes with a variety mechanical seal options to match your application requirements. Our regenerative turbine pump is known as a Coro-Flo®. The Coro-Flo regenerative turbine pumps offer a with wide range of differential pressures and capacities for stationary applications. They are a compact, pulse free, single stage design made for continuous duty applications. The side-channel pump is similar to a regenerative turbine pump since the impeller makes regenerative passes through the liquid. However, the actual design of the impeller and casing as well as the the principles of operation differ greatly. Side channel pumps are a multi-stage, continuous design capable of reaching a wide variety of differential pressures. They are capable of pumping liquids with up to 50% liquid. Corken’s industrial pumps are used in a wide variety of stationary applications such as bulk plant load and unload, vaporizer feeding, NOx reduction, boiler feed, and booster pumps. Corken’s industrial pumps are used by fuel delivery trucks, tank trucks, mobile (trailer), and tanker ships for bulk load and unloading applications involving refined fuels, solvents, and other light liquids. When one of our standard mountings does not meet your needs, let us customize one for you. Most custom packages are a modification of our standard mountings; however, if your needs do not fit with one of our custom packages, we can start from scratch and build you a mounting or skid from the floor up. Send us your specifications and one of our application engineers will help you design a package that fits your needs. For more information on compressor packaging and pump skids, click here. The marine industry – generally speaking – encompasses the construction, supply, design, innovation and technology for ships, boats, barges and recreational vessels. The marine industry as it relates to Corken focuses on marine transportation. Corken has a long history of providing loading and unloading solutions for marine transportation. Tanker ships and river barges are the primary marine vessels used to transport liquefied gases, refined fuels and chemicals. Barges are designed for short hauls along the river ways, while tanker ships are designed for longer hauls across the ocean. Corken’s reciprocating gas compressors are commonly used to load and unload barges and tanker ships at a liquid terminals storage facility. Depending on the tank size, a liquid terminals facility may use single or multiple compressors for the loading and unloading process or vapor recovery. Whether a tanker ship is delivering to the liquid terminals storage facility or picking up for a future delivery, Corken’s compressors are involved with each point of transfer. Other liquid terminal applications involve Corken’s sliding vane pumps. When a tanker ship arrives at a liquid terminal storage facility, Corken’s sliding vane pumps are used to refuel the ship with diesel. 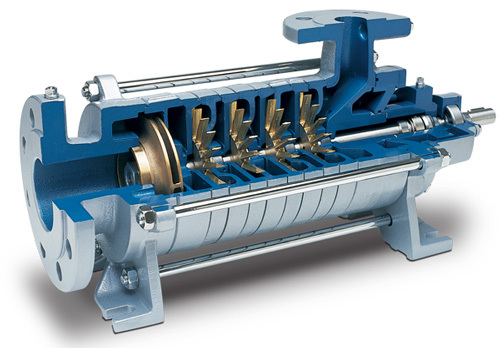 Corken’s sliding vane pumps are a great solution for transferring refined fuels. Other marine applications include diver gas reclaiming system (breathing gas) and providng shop air on large ships. Corken’s reciprocating gas compressors are used to supply reclaimed breathing gas (small amount of oxygen mixed with some gases) to divers as they are welding and constructing an underwater drilling rig. Corken’s compressors are also used onboard the ship to supply shop air for tools and equipment. The liquid terminals industry is made up of liquid terminal storage companies that store commercial liquids above ground in large bulk tanks known as tank farms. After bulk supplies of refined petroleum products (e.g. gasoline, diesel, fuel oil and kerosene) or chemicals (e.g. solvents, fertilizer, pesticides and acids) are produced, they are stored at a liquid terminal storage facility until distributed for final consumption. Some liquid terminal storage facilities only store chemical or petrochemical products, while other terminals may store an array of bulk liquids such as alcohol, asphalt, fertilizers, animal fats and oils (for cosmetics), vegetable oils (for food products), and molasses. In addition to bulk storage services, some liquid terminal storage facilities offer other services such as loading and unloading ocean-going tanker ships, river barges, pipelines, transport trailers and tank cars. When all of these products are delivered to and distributed from the liquid terminal storage facility, Corken’s reciprocating compressors and sliding vane pumps play a key role to each point of transfer. Fuel oil is a fraction obtained through the petroleum distillation process. Generally speakingfuel oil is any liquid petroleum product that is used by a furnace or boiler to create heat or by an engine to generate power. There is a wide range of fuel oil classes ranging from number 1 Fuel Oil that is a volatile distillate oil used in vaporizing pot-type burners to a number 6 fuel oil that is a high-viscostity residential oil that requires preheating. While fuel oil delivery does have some stationary applications at bulk storage facilities, most fuel oil is delivered by a Fuel Oil Delivery Truck. Common unloading applications include deliveries to oil change service centers such as auto dealerships, quick lube companies, and bulk deliveries to large transport tanks. Other truck unloading applications include fuel oil delivery trucks for home heating and diesel delivery trucks for farm and fleet fueling. Due to the wide range of viscosities and application conditions, sliding vane pumps are well suited to handle fuel oils.The reliablity of handling fuel oils is critical for transportation systems and this is where Corken’s pumps shine.The positive displacement, sliding-vane pump is an excellent means of loading/unloading, transfer, and circulating fuel oils.System components include pumps, meters, valves, registers, electronics, in cab data management systems and inventory control systems. Refined petroleum products, fuel oils, gasolines, aviation fuels, kerosenes, biofuels, solvents, & many others. Bulk plant transfer, fleet refueling, bulk loading & blending, aviation refuelers, fuel marketers, and delivery truck systems. The PT series and PZ series positive displacement, sliding-vane pumps are well suited for fuel oil bulk transfer (loading) and truck (unloading) applications. Adjustable, internal relief valve protects the pump from excessive pressure. Deliver high pumping efficiency and low noise. The self-adjusting vanes improve the pumping performance by compensating for wear. An optional air operated relief valve offers easy hose and nozzle handling. Our high recommended T-style strainers protect the pump from foreign material. The hydraulic drive option makes tight spaces a reality with a small compact package. Corken’s reciprocating gas compressors and sliding vane pumps are used to transport liquefied gases (LPG, ammonia and chlorine), refined fuels (gasoline, aviation fuel, biodiesel, lube oils, fuel oils), solvents and many more products. From residential deliveries of fuel oil and liquefied petroleum gas (LPG), to aviation refueling, to unloading railcars at a chemical plant, Corken’s reciprocating gas compressors and sliding vane pumps (Coro-Vane) offer a great solution for transporting raw materials and finished goods; the end location could be bulk storage facility, or supplying a process with a manufacturing or chemical facility. Liquefied gases are a gaseous compound or mixture that is converted to a liquid when compressed or cooled. They are stored under pressure and transported by a transport trailer, rail car or ship. Depending on the amount of vapor pressure, they are transported and stored in a refrigerated or non-refrigerated container. For example, propane, butane, ammonia, and natural gas can be stored and transported at ambient temperatures. However, liquefied natural gas (LNG), hydrogen and nitrogen have a much higher vapor pressure and must be stored or transported in a refrigerated container. Liquefied gases have many uses for everyday life. Propane and natural gas are used to heat residential homes and businesses as well as fueling private vehicles and fleets. Refrigerants are used for cooling food, homes and automobiles. Ammonia is used in fertilizing applications in the agricultural industry. A host of other liquefied gases, petrochemicals ethylene, propylene, benzene, butadiene, and toluene, are used to manufacture a large number of consumer and commercial products. Other examples include oxygen, carbon dioxide, chlorine, methyl chloride, nitrogen, oxygen, argon, carbon dioxide, hydrogen, helium and many other specialty gases. Since liquefied gases are sensitive to temperature and pressure changes, they are considered volatile. Also, most of them are thinner than water so pumping them can be challenging. Any increases in ambient temperature or pressure losses in the piping system can cause a liquefied gas to change from a liquid to a vapor. In contrast, any decreases in the ambient temperature or increases in pressure will result in a change to a liquid form. While vapor is mandatory for a compressor application, it is important to keep the liquefied gas in the liquid phase as much as possible in a pump application; the absence of vapor eliminates cavitations and maximizes pump performance. Corken sliding vane, turbine, and side channel pumps are specifically engineered to handle these thin, often volatile, liquids. Corken offers both truck and stationary pumps for unloading and loading stationary tanks and transport trailers. Depending on the application requirements, the regenerative turbine (Coro-Flo), sliding vane (Coro-Vane), and side channel (specialty) pumps are great choices for moving liquefied gases. When the piping system for a liquefied gas application does not provide adequate net positive suction head (NPSH), a reciprocating gas compressors is the best choice. Tank car unloading and underground tank applications with top unloading connecitons are a fews examples where a reciprocating compressor should be applied. Corken’s reciprocating compressors are utilized in the completion and production phases of the well. On an oil well, vapor recovery and gas lifting are common applications for a reciprocating compressor. If an oil well is not connected to a pipeline, the extracted crude oil is temporarily stored at the well site in large tanks until transported to the refinery. During this time, the natural gas, a byproduct of the crude oil, will build vapor pressure within the storage tanks. A vapor recovery compressor will be used to remove the vapor that separates from the crude oil. When the reservoir pressure of an oil well no longer provides sufficient pressure to keep a well in production, gas lifting is a common solution. In a gas lifting application, Corken’s reciprocating gas compressors are used to inject gas into the fluid (crude oil). The injection process aerates the fluid with gas bubbles and reduces the fluid density. With a reduced fluid density, the existing well pressure is able to force the aerated fluid out of the well. As a gas well is depleted, the production rate decreases over time. The decreased production is known as the decline rate. To improve the production rate, a Corken reciprocating compressor is used to pull down the well and increase the pressure flowing to the gas gathering system. Other uses for Corken’s reciprocating gas compressors include liquid transfer and vapor recovery applications. After the raw natural gas is recovered from the well, it is sent to a natural gas processing plant where the natural gas liquids (NGLs such as propane, butane, ethane etc.) are separated and placed into temporary storage tanks. Corken’s reciprocating compressors are used to unload the NGL tanks and recover the vapor. The T-style is an oil-free compressor has three sets of V-ring packing per packing rod that form two barriers to external leakage. The barriers are also known as distance pieces. The lower packing set has an adjustable packing screw that is used to maintain maximum sealing performance throughout the life of the packing. Each distance piece has its own line connections that can be padded, purged, or vented separately. This allows you to choose the best method of containment for your application. For added convenience purge kits with all of the accessories needed to control the purging or padding of each distance piece are available. Since there is no piston rod over travel between the crankcase and compression chamber, all of Corken’s T-style reciprocating gas compressors offer oil-free gas compression. T-Style compressors are used when oil-free gas and maximum leakage containment are critical. T-Style industrial compressors are compatible with a wide variety of hazardous, volatile, toxic, and corrosive gases such as chlorine, vinyl chloride, methyl chloride, sulfur dioxide, butadiene, hydrogen, helium, and many more. Each compresssor is available with a standard mounting or we can custom engineer a compressor package for you. We now offer an ASME B31.3 – 2012 piping option for all of our compressor packages and skids.